Stroll through history to pre-revolutionary days where you’ll find the origins of A WATERFALL FARMHOUSE, an updated, fun and fabulous 3600” sq. foot farmhouse with its own private swimming hole on the prettiest road in the neighborhood. The three-level updated farmhouse, once a boarding house for the orchard and tannery workers, will pamper you with its top of the line subzero refrigerator, Wolf stove and Kitchen Aid dishwasher. Laundry is no problem with the super-sized Samsung washer and dryer. The two full baths provide a luxurious steam shower as well as an old fashioned claw foot tub. An enormous loft bedroom with a kingsize, memory foam mattress is the height of luxury and privacy. Two generous guest rooms make this the ideal venue for family gatherings and celebrations. Hiking trails abound as do wild turkeys, deer, rabbits and fascinating birds. 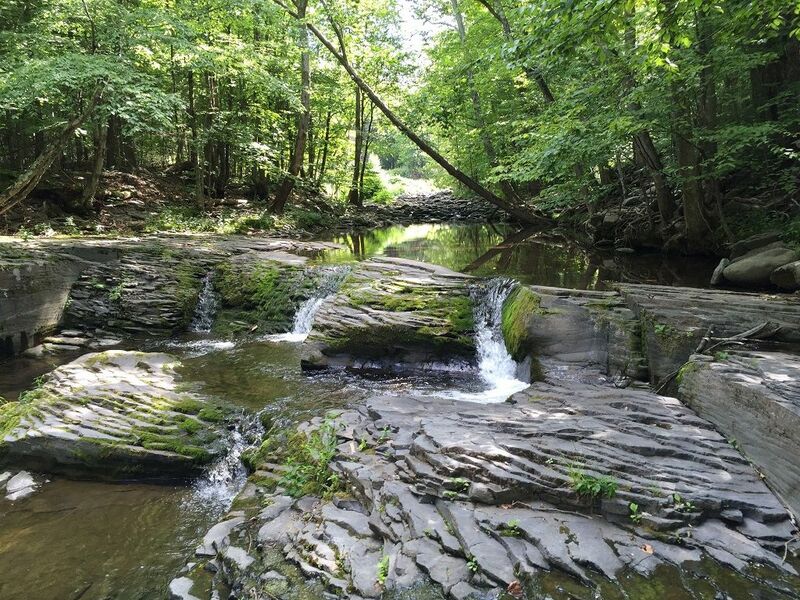 After an afternoon exploring nature or the shops and galleries in nearby Woodstock and increasingly sophisticated Saugerties, enjoy a refreshing dip in the crystal clear swimming hole and marvel at the beauty of the waterfall, a neighborhood treasure cherished by generations of locals. A propane as well as a wood burning stove will keep you cozy at night. Minimum Age Limit For Renters: We require adult supervision around all water features as these could be hazardous for unsupervised toddlers and very young children. We welcome responsible adults. Use of any water features is at your own risk.